Starting with an easy sewing project is a great way to learn to sew. Those same simple projects are a great way to revive your spirits when you just need to sew something without getting into a complex sewing project. These easy to follow directions walk you through creating a simple, washable cover for your throw pillows. These are my favorite potholders! The padding is removable so they stay new looking wash after wash, and use up my scraps of fabric. This easy project makes a great stocking stuffer and uses up your fabric scraps. A slit front style is a simple cover ready to use for tissues or create an envelope style that works well to keep feminine products discreetly hidden in your pocketbook. This simple to sew project ends with a usable tote bag for groceries or for travel! We've never met anyone who couldn't use another tote bag, especially at vacation time! This simple to sew roll-up tool holder is a great way to tote your tools to class or keep them secure at home. Convert a strip of fleece to make a useful scarf and hat in one. This project is a great way to keep a little one's head and neck warm with one simple garment. This grocery bag caddy is a great way to keep your used plastic bags at hand to re-use them. Make one to match any room! When you have daughters, it's smart to take a day or two and make bags full of hair scrunchies. That way, you're always ready to replace the ones they lost! 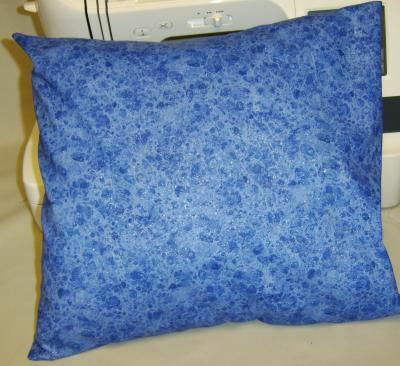 Pillow Patterns - Free Patterns for All Kinds of Pillows for Your Home!